At present, the United States confronts the most complex and uncertain international environment in its history…. Such an international environment obviously carries with it serious implications for the U.S. military. It suggests that the threats to American interests, as well as those of its allies and partners, will range across the spectrum of conflict from peace keeping to peace enforcement to mid level conventional conflict, all the way in the best case to deterrence, and in the worst case, war at the high end. Thus, the ability to adapt at every level of war from the tactical to the strategic and political would seem to be more important to the American polity and its military than at any time since 1941. There is going to be no simple path for the preparation of the U.S. military to fight the wars of the future…. The objective of this thesis is to demonstrate the process for developing an organizational structure that can perform stability missions, and through the course of that process develop a stability force. It demonstrates an approximation of what a serious civilian based effort at performing stability missions should look like. A holistic review of stabilization and reconstruction (S&R), and occupation needs is provided with a focus on stability requirements, to address the idea of “how to” organize a paramilitary constabulary force. The author points toward developing relevant doctrine, and designing a functional constabulary corps with a brigade centric organization. This thesis also provides a context for using a civilian paramilitary constabulary to do a variety of operations: from humanitarian aid to post conflict stability. The shortfall in many discussions is the lack of a defined organizational structure around which technical deliberation can be held. Such insight is needed before legislators can act to support any significant modifications to national policy and practice. One has no illusions that this proposal reflects a best or final solution. No, it is intended as a start point from which a solution can be molded. This thesis delves into the gamut of needs and recommendations for stability operations that various analysts and major agencies have written on the subject of during or post conflict, as well as related conflict prevention and peace building principles. It sets forth the unique requirements and measurable deliverables for designing and establishing successful constabulary organizational structures. This would allow the Department of State to step out from behind the military and stand as an independent entity on the battlefield. The immediate purpose for revealing and expounding upon these standards is to conform to international conventions, minimize human suffering, satisfy ethical expectations, and enhance global security that impacts the United States. The product goal is to create (not just principles, but) tools that can establish functional states that exercise just governance with minimal corruption, facilitates the people’s ability to engage in international commerce, and pose no threat to global peace. 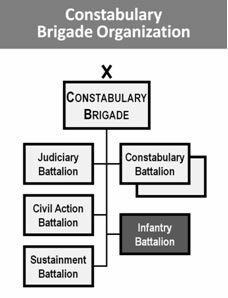 Figure I 1: A high level view of a fully developed Constabulary Brigade. It consists of 6,500 to 6,600 troops. It could operate in an area alongside three to six Army brigades. Out of the requirements emerges the Constabulary Brigade (Figure I 1). This proposal demonstrates the systematic process for the development of doctrine for organizations that have the planning capabilities to enable civilian led paramilitary police forces to perform S&R operations proficiently. They are configured with the assets, personnel, facilities, and materiel to be self sustaining. The thesis proposes a boots on the ground, people in the community, pragmatic yet charismatic style of visible help. This brigade is a “first responder” focused on the most immediate and critical need: stability. This brigade is a rapid reaction force that can step into the breach of a collapsing country and provide immediate (governance) triage, securing and calming the local populace, then prioritizing governance deficiencies or infrastructure damage for treatment according to the seriousness of the condition: a battlefield stability mission. The thesis looks at the internal structure of proposed constabulary units down to the company level in technical detail. This is done to show civilians who are unfamiliar with military organization how military design principles would be applied to civilian functions. A rudimentary effort is made to estimate the size of such organizations. This provides government executives with a rough level of effort to plan for future developments when trying to secure funding. For all its ability to wage war, the US military is unprepared to mount major stability operations and secure a lasting peace. Furthermore, U.S. civilian agencies lack the tools to take the job over from the military. Likewise, the American government’s capacity to plan for and oversee both civilian and military post conflict nation building operations is wanting. This analyst suspects that there is no structured multi-year plan for what’s next in our nation’s strategy for dealing with security force assistance, peace enforcement, or occupation operations. Yet, the evolving complexity of the international environment and the history of the most resent conflicts suggest that defaulting upon the military to conduct politics beyond Americas’ shores is self limiting to the nation, and unrealistic burden upon the Department of Defense. This thesis proposes an organization that is focused on stabilization efforts during and just after combat, in accord with the laws of land warfare and United Nations charter. The thesis provides an earnest look at the missing requirements that have plagued U.S. led stability operations. Out of these missing requirements evolves a solution for a Constabulary Brigade. What this analyst is presenting is a design and a design process for a paramilitary organization that addresses the issues brought up by the multitude of other analysts cited in this thesis. Hopefully, the Department of State, United States Agency for International Development, the Department of Justice, and the Department of Defense will review this thesis and use it as a resource to collaborate on a solution to stability operations.